So it’s been nearly a year since we installed the solar panels. That’s our daily average energy consumption since then. Moving to solar has taken 10% off the power consumption. This is without optimising when I run the mains charger. 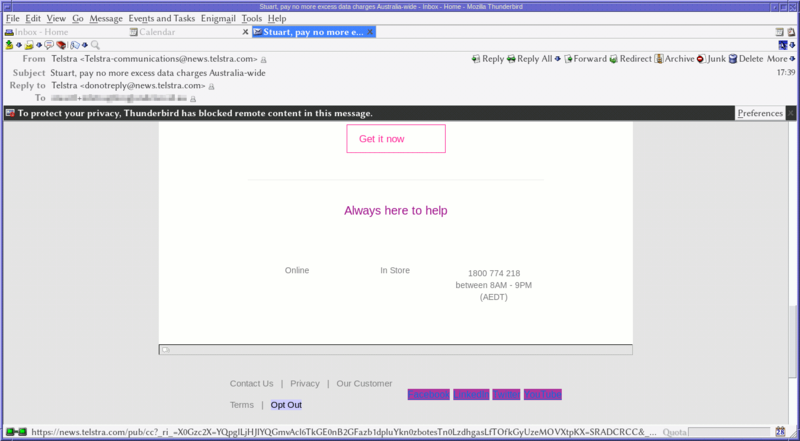 So this evening, I got a bit of marketing from Telstra. This was to an email address I had used to register the SIM card that I’m trying out in the Kite. 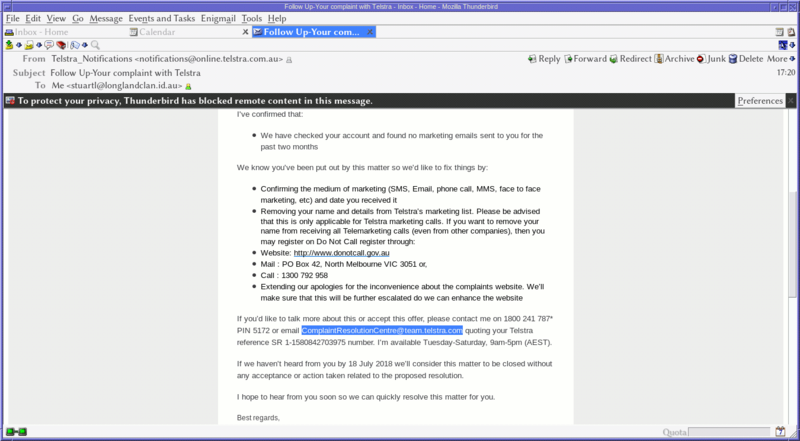 I naturally followed the same approach I have with other such suppliers as an anti-phishing tactic. Errm, excuse me? That is the email address that I wish to unsubscribe, and if it were invalid, I would not be trying to unsubscribe because I would not have gotten the email in the first place! 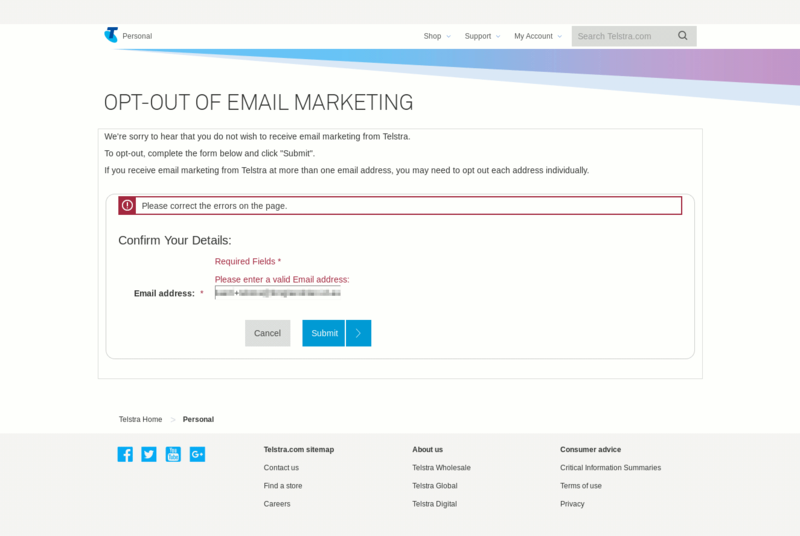 <b>Enterprise and Government customers:</b> please go to your specialised contact page <a href="https://www.telstra.com.au/business-enterprise/contact-us/make-a-complaint" target="_self">here</a>. As a result, Firefox thinks everything to the end of the form, is part of the link! They also close a tag that isn’t open: <pre>. UPDATE 2018-07-07: This has now been fixed. Right, so there’s two things. I persevere with the form, resorting to keyboard shortcuts since clicking on any form element brings up that PDF. Happy that I’ve covered what I wanted to say, I hit the submit. Only to find out the same person who designed the last form, must have designed this one too. Great, so that’s now three things to complain about. What really saddens me with Telstra is that today their management tell us they “aspire to be a technology company”. 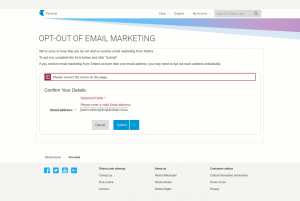 The fact that years ago, Telecom Australia was very much a respected member of the ITU meant it pretty much was a technology company… and the fact they can’t get something as basic as email address validation or a simple web form right, really does show how far they have fallen. I fully expect this will go back-and-forth while they ask for my browser details (irrelevant, this is broken HTML at their end), my OS (again irrelevant), and then the claim that: “Ohh, we don’t support that!” Which will hold about as much water as a tissue paper G-string. They make no comment about fixing the forms. The complaints form now has its closing </a> tag back, so clicking on form elements no longer causes it to pop up with a PDF download. Great, 1 problem of 3 fixed. > complaint relating to your Telstra account number xxxx xxxxx xxxx. > I'm pleased to offer you the following resolution. that came with it, that was unwanted. up whether they want to be on this marketing list or not. mobile phone: iSquare Mobility Kite v1. http://www.kiteboard.io/ is the device being trialled. conditions. I have loan of it possibly for another month or so at most. service moved to a new SIM. and won't have any interest of any offers from Telstra (or Optus). Allow me to present exhibit A; sent Thu, 28 Jun 2018 00:39:53 -0700.
see the address my account was *actually* registered under. entire form to act as a hyperlink to the complaints information PDF. the complaint in the first place. I see the missed tag on the complaint form has now been corrected. The original issue that started this, so far has not been corrected. This is email marketing. There have not been any other forms of marketing. 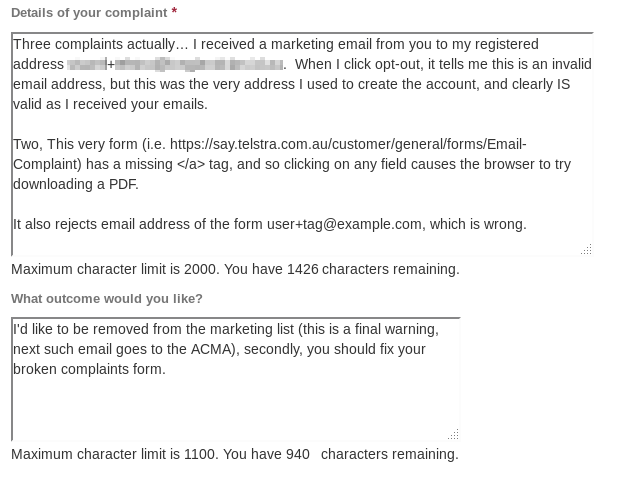 > * Removing your name and details from Telstra’s marketing list. x-xxxxxxxxxxxxx just in case this email doesn't get through. So that's now 4 issues in total, with 1 resolved so far. then that will resolve the remaining issues.